Have you heard of the Violet Crown trail (formerly the Walk for Day trail) that will connect downtown Austin to Kyle? SMGA envisions connecting to that trail from downtown San Marcos northward. By utilizing the SMGA Loop & Check vision map and continuing further north along the Blanco River (past Blanco Shoals and Five Mile Dam), San Marcos could link to the Violet Crown trail. The vision entails existing natural areas and parks, expanding the San Marcos greenbelt trail system, and protecting riparian areas along the Blanco River. It is also a connection of people, gathering places, playing fields, river access, neighbors, and communities. 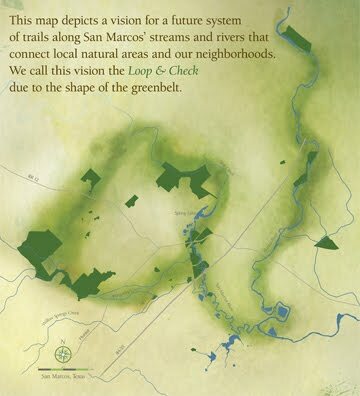 A robust greenbelt system will make us the envy of neighboring communities, help sustain our economic vitality, and is a wonderful way to showcase the beauty of Hays County. Hays County is taking citizen input regarding the Hays County Master Plan. Complete the county survey here. The survey will be open until May 11. Send an email to [email protected] and/or the county judge and/or your commissioner. ([email protected], [email protected], [email protected], [email protected], [email protected]). I am writing in support of connecting the San Marcos River parks to the Violet Crown/Walk for a Day Trail along a route from downtown San Marcos along the San Marcos River to its confluence with the Blanco River, then north along the Blanco River, past Five Mile Dam, to just south of 150. I support using creekways to protect our water and other natural resources, provide hike and bike avenues that connect neighborhoods to parks and communities, and offer passive recreation that will enhance the county’s economy while improving the quality of our lives. Please include this connection in the Hays County Parks Master Plan. If you would like to know more about the previous plan or simply understand more about the master plan process visit http://www.co.hays.tx.us/index.php/living-and-visiting/parks-department/parks-master-plan/.